There are some downsides to images, one being that they can slow down the loading of your website. While our servers are quick and will provide your visitors with fast loading pages, it's still important you optimise all of the images you use on your website. When you save your images, you can choose which file type it is by right clicking in the drop down box where you enter the filename. It's a good idea to give an image a meaningful file name, such as bluebabybib.jpeg not 343232.jpeg as it helps with your website SEO as search engines can 'read' text, not images. 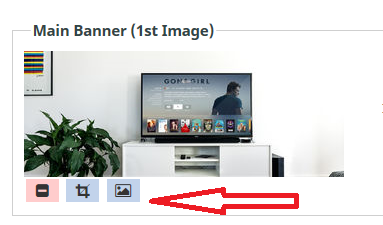 Where there is no default image size, you'll be automatically suggested an maximum image size of 960x960 pixels. 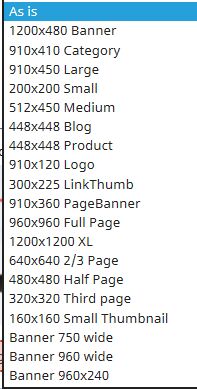 You can however override this by selecting the button Change Default Image Sizes. a 320x320 pixels thumbnail image. This is only used in galleries, product lists and directory listings where there are a lot of images on a page. Where things can get confusing is that image size and file size are two different things. The image size, which is the size the image shows on your screen, is different from the file size. However the two are related when it comes to image optimisation and generally the smaller the better for both. The file size is the amount of data or information saved within an image. There are many websites online which provide free or paid tools for you to shrink the file size of your images including Image Optimizer, Optimizilla and Kraken Image Optimizer. The aim when optimising your images is not to reduce the quality of the image, though in some cases this does happen, but to shrink the file size. Once you have optimised your images, simply upload them to the CMS and your website. Dragging images from your computer into the open web browser you are using to work in your CMS. Our system will them automatically import these images. This can be done in different areas of your CMS such as with Galleries and Products. To be able to drag the image, you will need to have the file open where the image is saved and then click and hold on the image to bring it over to the text 'Or drag & drop a photo here (JPEG, PNG or GIF). You can drag a photo into your CMS wherever you see the image icon. The image will them automatically upload your image. Or you could click on the image icon to have access to additional controls over how your image looks, such as cropping and rotating. You can use an image you have previously uploaded. It will be found in the Image Wizard, under the tab All My Images. Using the Image Wizard, you can upload a new image file using Upload File. Simply choose the Browse button and it will open access to your computer files, from where you can select an image. Click on the image and then back in the CMS, click on Upload. You are then given the option of editing your image and how you would like it to appear on your website, depending on where you are uploading it. 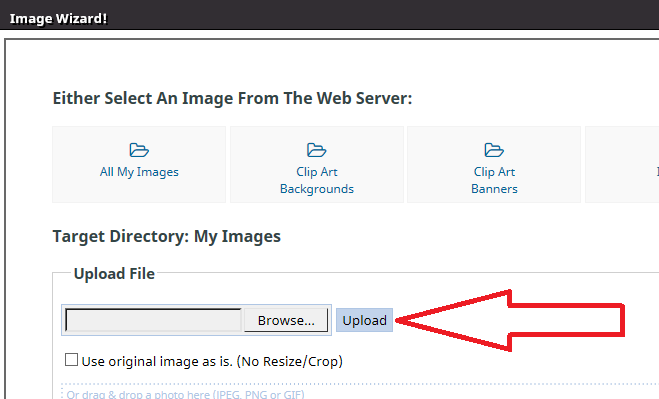 In the Image Wizard, you can copy an image which is hosted on another website. Using the Firefox browser, simply right click on the image you want and select the option which says Copy Image Location. Then paste that image URL into the Import Image box. You can also enter the URL of the page the image is on, but this may upload every image on that page. It's important to remember though that you should be optimising your images before uploading them.